Every man has all he needs; within you is your strength, resources whether natural or human. Independence can never be juxtaposed to provision. You can't collect and provide, you can't be a refugee and still a ruler, you can't live on people and still be their leader, you either collect or you provide. If only we could look deeply right within us, we have all we need to survive. Singapore was so scared of letting all their allied countries to leave, but the countries were ready to leave anyway. Despite Singapore appeals, they left, and Singapore had to face life alone. Their main problem was the lack of natural resources like crude oil, gold, diamond and the likes whereby they can sell in the international market and use the proceeds to fund their economy. However, this didn’t stop them. They became a developed country from nothing, just by looking within themselves through the help of Lee Yuan Kew. They knew they had something despite no natural resources. They harnessed their human resources and that was all they needed to succeed. Who is Lee Yuan Kew? Lee Yuan Kew, who lived from 16 September 1923 to 23 March 2015 was popularly known by his initials as LKY. Lee Yuan Kew served as the first Prime Minister of Singapore and governed for three decades (30 years). 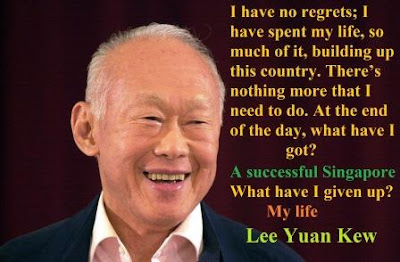 Lee, as fondly called is recognized as the founding father of Singapore because the country was able to transit from a third world country to a first world country in a single generation under his leadership. Lee attended the London School of Economics and later studied at the Fitzwilliam College, Cambridge University where he graduated with double starred-first-class honours in law. Lee practiced law for nine years before he started the People’s Action Party (PAP) in 1954 and served as the first secretary general till 1952 after securing eight consecutive victories. Lee then decided to step down in 1990 as a Prime Minister but remained as a Senior Minister under Goh Chok Tong, his successor until 2004. He later served as Minister Mentor under his son Lee Hsien Loong till 2011 which sum his ministerial years to 56. He also continued to serve his constituency, Tanjong Pagar constituency close to 60 years as a member in the parliament before he died in 2015. Lee fought for the independence of Singapore from colonial rule of Britain and after a successful pull out through national referendum, the state decided to merge with other states that were under the British rule to form Malaysia in 1963. Due to racism and differences in ideology, the merger couldn’t stand a test of time and after two years, they parted ways making Singapore a sovereign state controlled by the parliament. Under Lee, Singapore significantly transformed from a stagnant British colony to an Asian Tiger economy. To achieve this, Lee developed a government based on meritocracy (deserving of post based on what you can offer and if you fit in), and as well highly effective and incorrupt civil service and government. Currently, many policies of Lee Yuan Kew are taught at the Lee Yuan Kew School of Public Policy. Instead of a normal politician following the populist policies to aid corruption and stealing of public funds for personal purpose, Lee Yuan Kew rather focused and utilized Long-term social and economic measures. With concentration on multiracialism and meritocracy as the basis of the government, Lee made sure English was the common language in order to accommodate and integrate its immigrant society, improve trade with the west and as well mandated bilingualism in schools in order to keep the mother tongue and preserve ethnic identity. Though criticized for limiting civil liberties, he argued that it was necessary in order to stabilize the polity and aid economic progress. Lee Yuan Kew died at 91 of pneumonia. Up to 1.7 million paid him a tribute at his lying-in-state at the Parliament House. Lee Yuan Kew, a fourth-generation Singaporean was born in 1923 at Kampong, Java Road, Singapore. He had three younger brothers; Dennis Lee Kim Yew, Freddy Lee Thiam Yew and Dr Lee Suan Yew. He also had a younger sister named Monica Lee Kim Mon. Lee’s parents were English-educated and they named him ‘Kuan Yew’ which means ‘light and brightness’ along with an alternative meaning ‘bringing great glory to one’s ancestors’. Lee got married to Kwa Geok Choo on 30 September 1950. The both of them learned and spoke English as their first language. Lee was deficient in the Chinese language and started to learn in 1955 at the age of 32. He later learned the Japanese language. Lee Yuan Kew started at the Telo Kurau English School in Singapore in 1931. In one of his accounts, he described the students of the school as poor and unbright. He then proceeded to Raffles Institution in 1935 where he also struggled because he met the best 150 students from all of Singapore. Lee later joined the Scouts where he featured for three years playing cricket, chess and tennis and also participated in debates for the school. He won scholarships and was the best in the School Certificate examinations in 1940, which made him win the John Anderson Scholarship to study at Raffles Institution Junior College. Lee’s wife to be then, Kwa Geok Choo was in the same class with Lee and was the only girl at the institution. Kwa was also known to be brilliant and was the only one who beat Lee in English and Economics subjects.